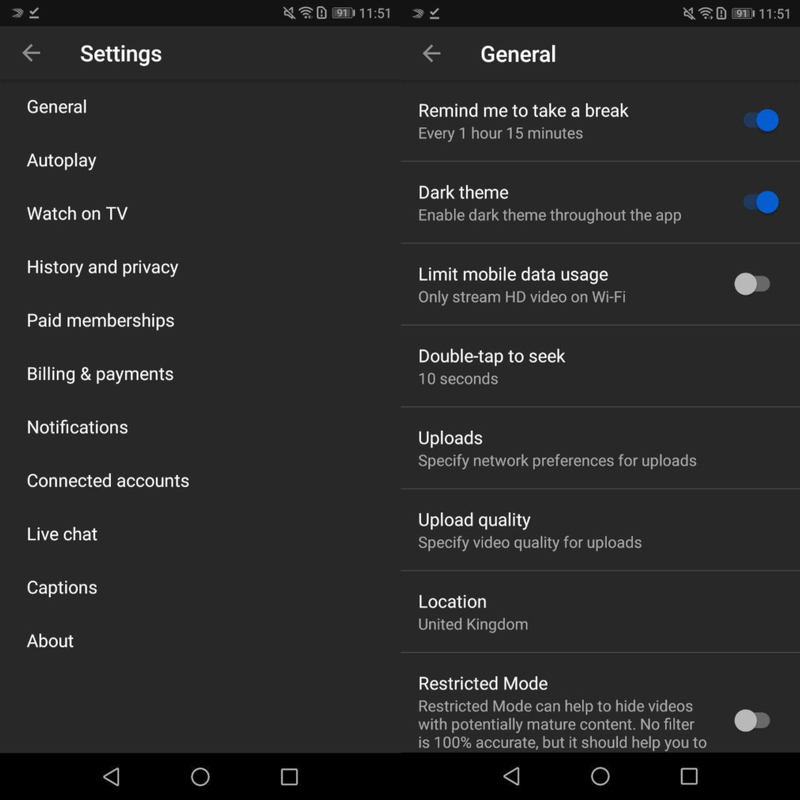 We teach you how to activate the night or dark mode for a bunch of Android apps that you probably use on the daily. 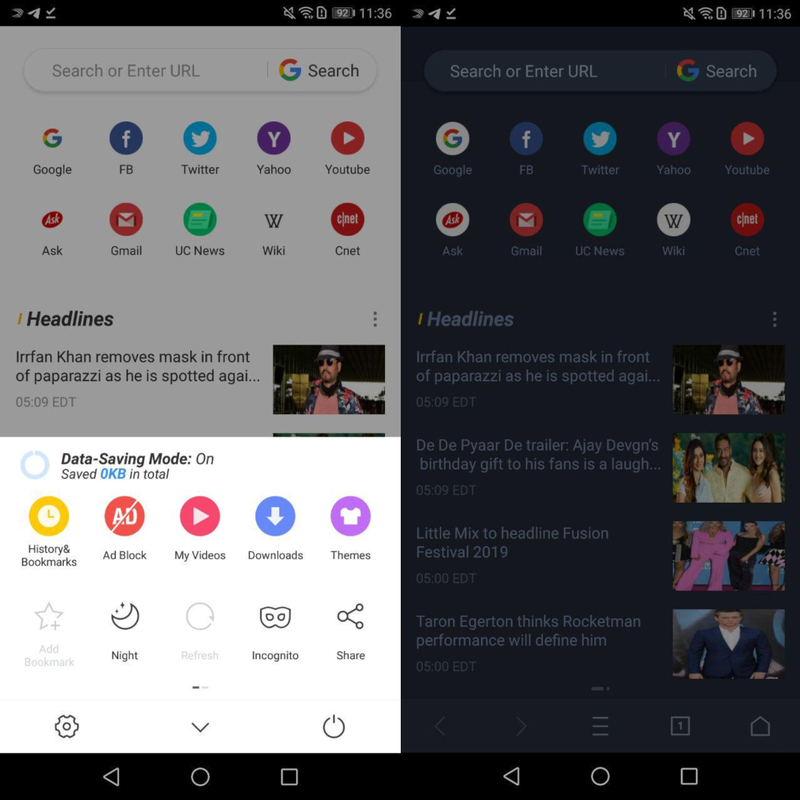 In recent months, a bunch of apps have launched a night mode or dark theme. Although it may seem like a trend, the truth is that you can prevent eye strain caused by screens by simply activating this option. It’s also been shown that applying this mode can help reduce battery consumption. In fact, if your smartphone has an OLED screen, each black pixel will turn off. 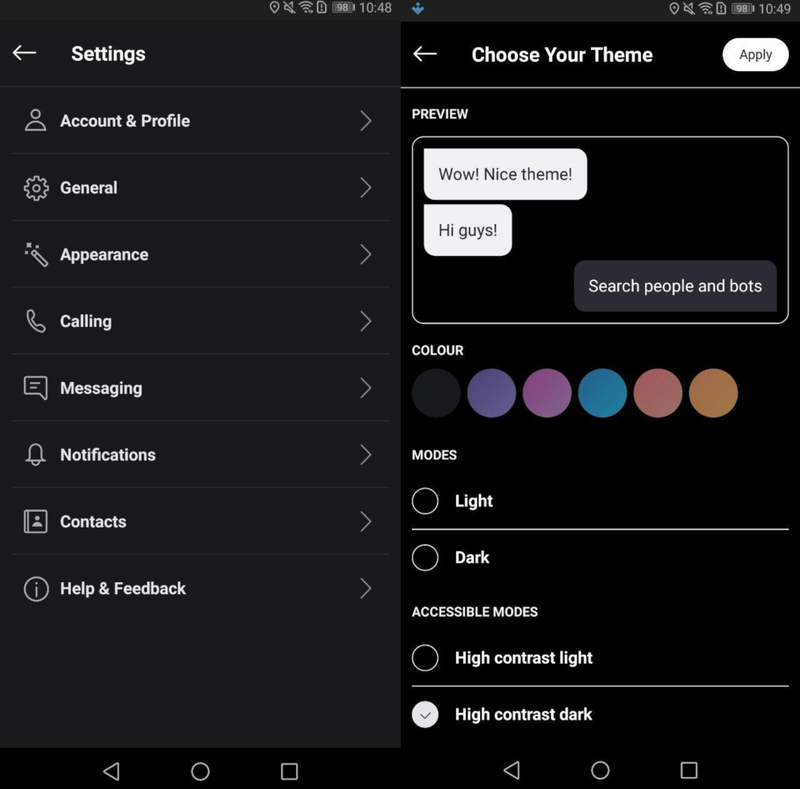 Therefore and in light of all of the above (pun totally intended), we thought it was a good idea to make a list of steps on how to apply the night mode on the apps you use the most. 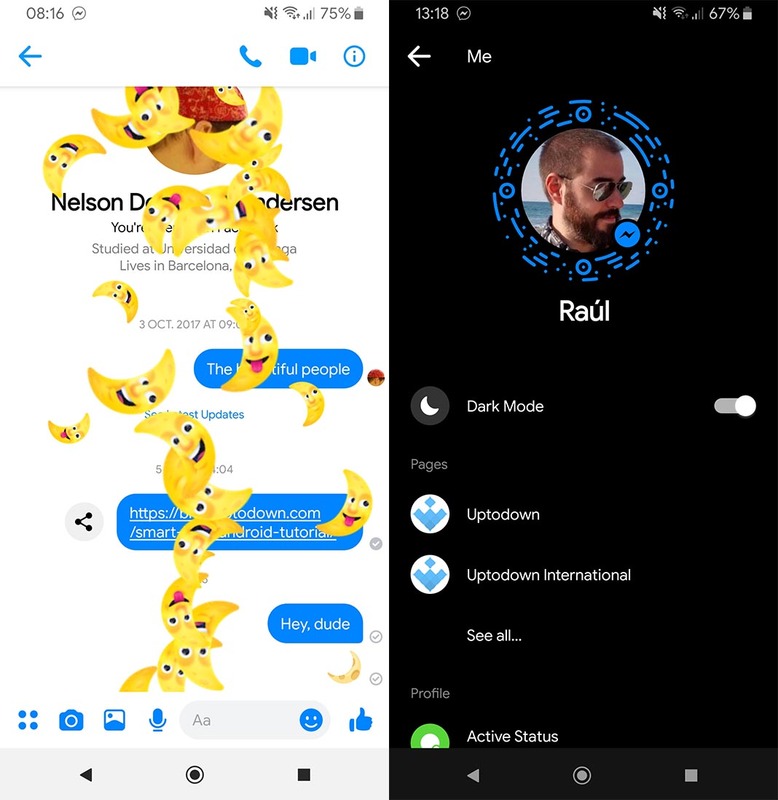 There are many examples of messaging apps that include a night mode. It’s actually a bit surprising that WhatsApp doesn’t offer its users this option yet. 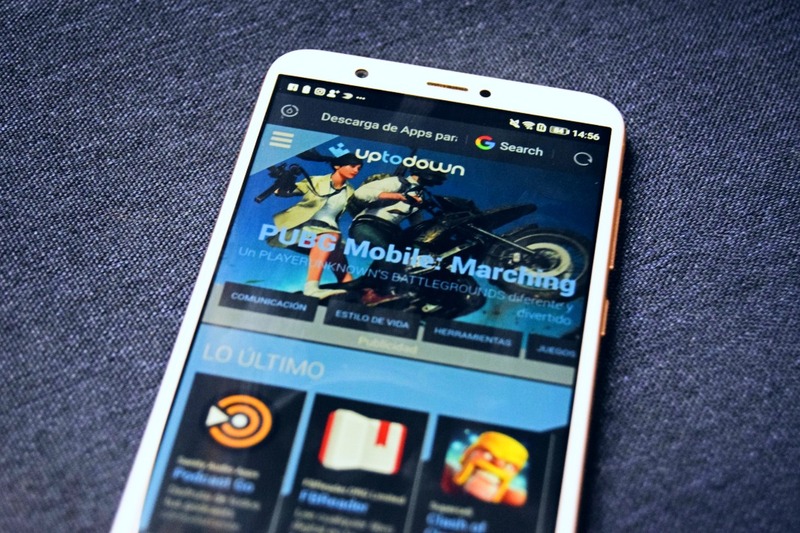 However, that downfall won’t last long since the developers of this messaging giant have disclosed to WABetaInfo, that they’re currently working on incorporating a dark interface in the upcoming updates. 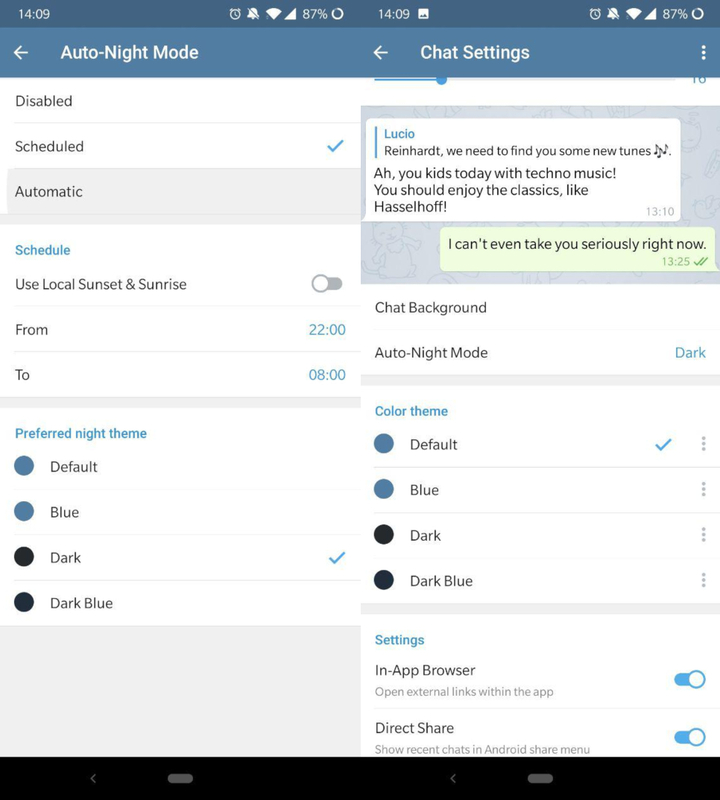 Although that’s good news to WhatsApp fans, they sure have taken their time if you consider that Telegram’s night mode was released back in 2017. Once you’ve gotten to this point, you can access a bunch of possibilities to customize Telegram’s interface and adjust it to your needs. You can also program your smartphone to change from day to night mode automatically, depending on the time of the day. Last but not least, you can also manually set the times of the day when you prefer to use the night mode. The Facebook messaging tool also allows you to activate the night mode. A really simple trick lets you chat with your contacts without straining your eyes with the usual white background. This option is really useful for regular users who want to have long conversations at night time. Activate the night mode using the notification that’ll appear on the upper part of your screen. 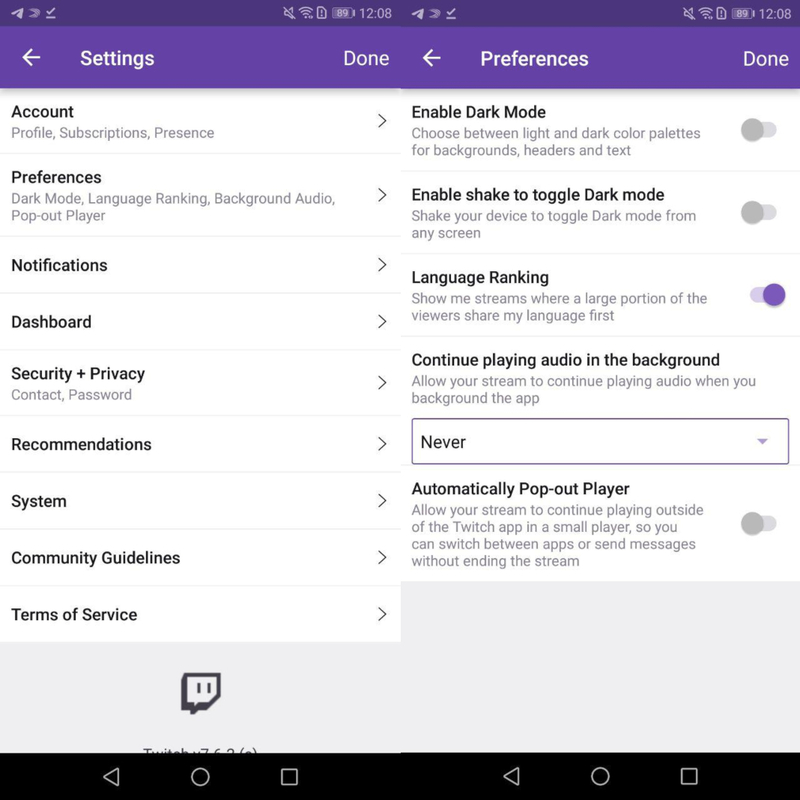 When you reach this point, you’ll find several options to customize the night time mode. In fact, you can either choose black hues that contrast against white hues or an interface that doesn’t include a single bright element. A good number of Android users spend hours browsing portals that include a fair amount of text. Therefore, it’s probably a good idea to modify your web browser’s interface and give your eyesight a break from the bright themes. That’s right folks, as you may already know, reading with your smartphone’s screen could be as uncomfortable for your eyes as reading on a Kindle or any other e-book. 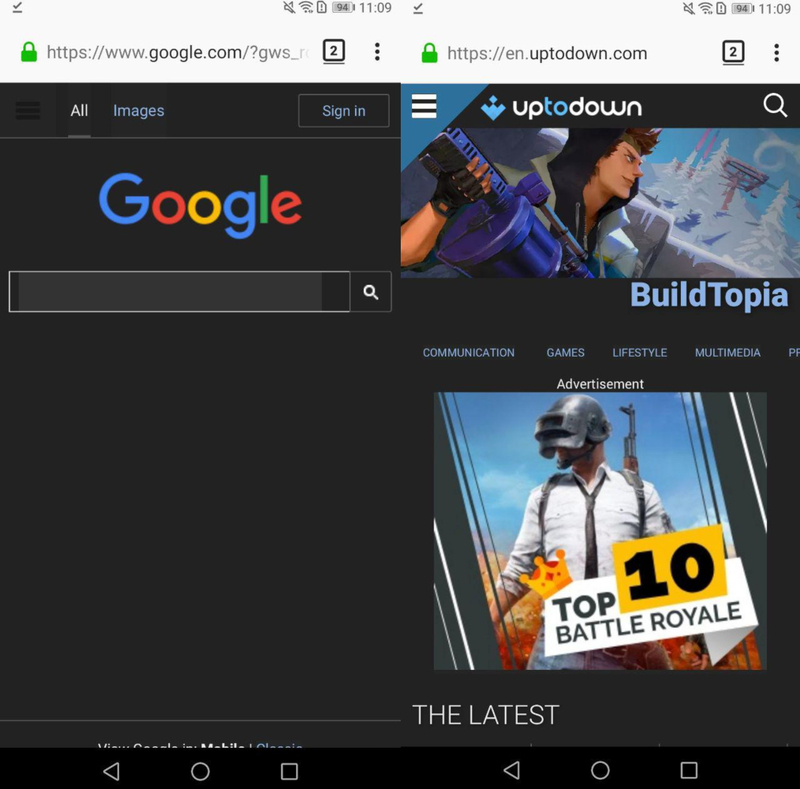 Using the browser integrated into the app, look for Android Chrome UI Dark Mode and Android Web Contents Dark Mode. Enable both to activate them. Then, activate or deactivate the newly added night mode using Chrome’s basic settings menu. Now, all you have to do is access the sidebar and you’ll notice a new option at the bottom. 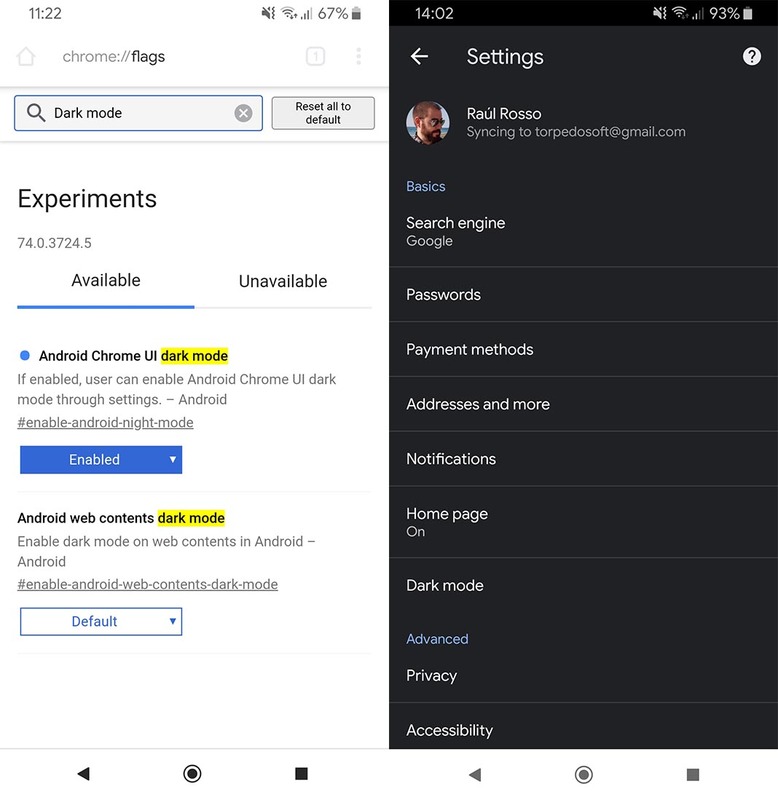 Tap on this section to activate the night mode and a dark background will be automatically applied to all the webpages you browse. UC Browser most definitely stands out because of its speed and simplicity. It is precisely that simplicity that allows you to apply the night mode and get rid of the interface’s white background in seconds. Tap on the three bars to access the main menu. Twitter is yet another tool that cares about enriching user experience. 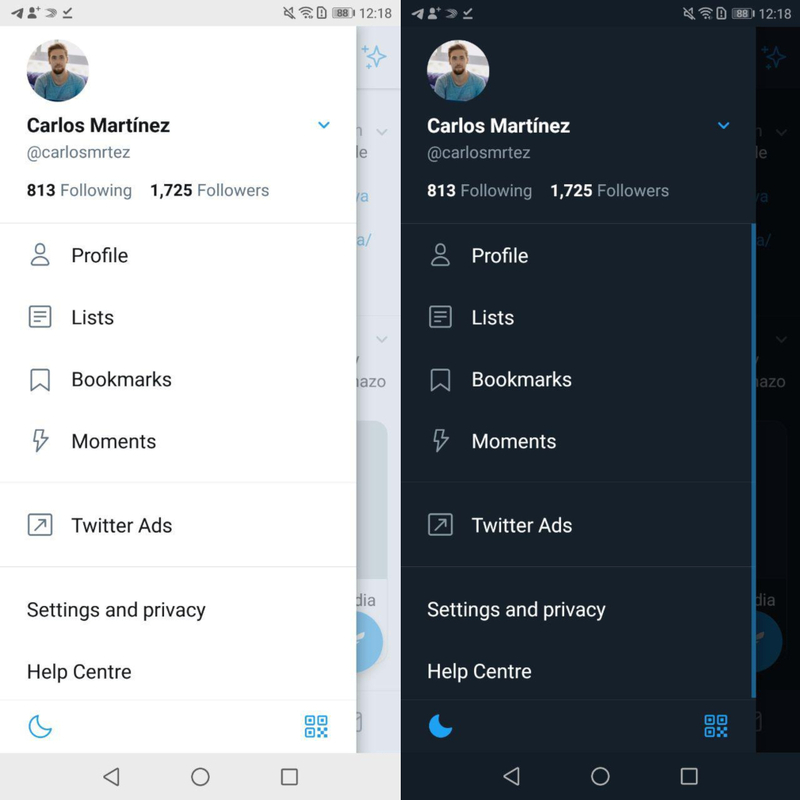 That’s why it’s introduced the night mode for both its mobile and desktop versions. 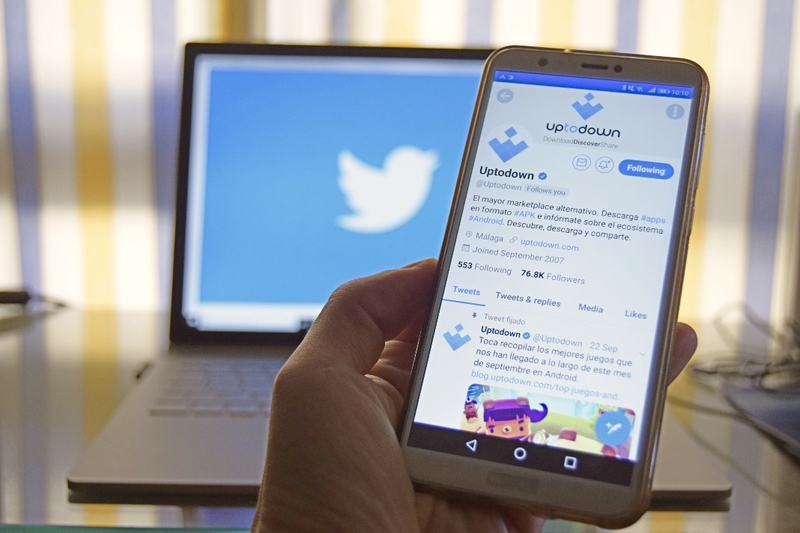 With this mode, you can now post tweets and create threads without having to worry about harming your eyes with its emblematic white interface. We may even dare to say that once you try this new look, you’ll never want to go back to its brighter counterpart. Without a doubt, a night mode is more essential when you’re watching videos. That white background behind the video can be especially bothersome for your eyes. That’s why Youtube and Twitch have tried to improve user experience by adding an interface that features black hues. 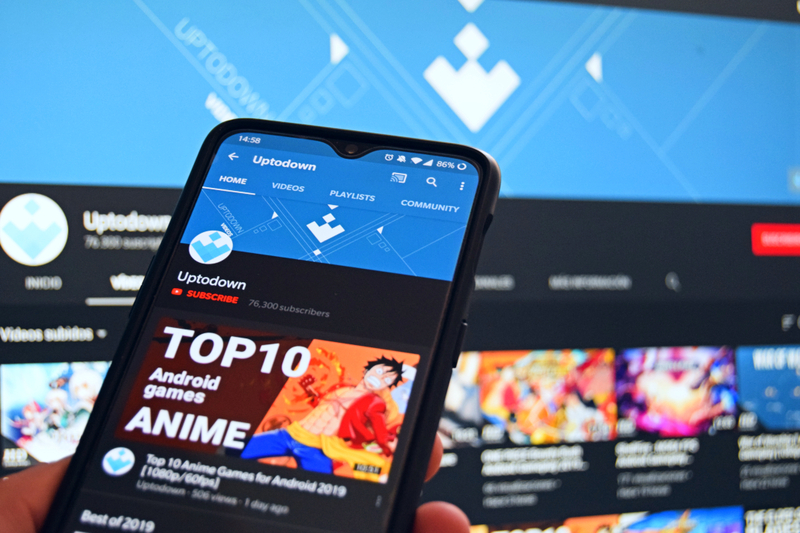 Once that’s done, you’ll see the YouTube interface automatically change from its light to its dark theme, which is less harmful to your eyes. As a bonus, if you also activate the tab that’s located just below, you can activate or deactivate the night mode by shaking your smartphone. You can improve several aspects of your health by simply applying the night mode in the apps you use the most. There are many studies that warn about the side effects of spending hours looking at multiple screens. It’s up to you to cancel out the majority of the harmful pixels which can help you prevent disorders such as anxiety, visual fatigue or insomnia. 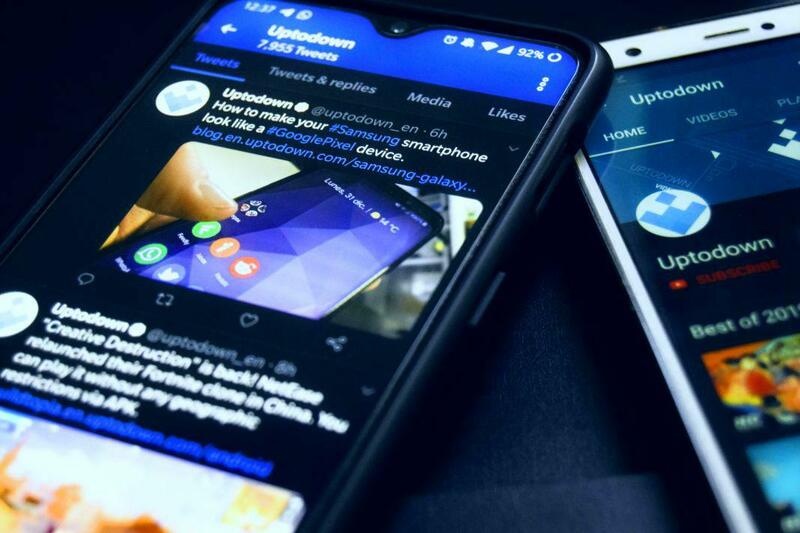 Plus, the night mode can also help your smartphone’s battery life. Although it’s not as important as preserving your health, this last aspect is important if you don’t usually carry the powerbank on your pocket at all times.